A chance to be creative! Just a quick reminder about a few classes coming up, that have a some seats left. A fun and simple painting on canvas, just in time for Valentine’s Day! Learn to add vibrant color to copper pieces with powdered enamels. $150 per person, includes instruction, use of tools and materials. $25 per person for use of dye and dyeing tools. Fabric or items that you choose to dye are an additional cost. You can dye fabric yardage, or we have a selection of bags, placemats, napkins etc.. to choose from. First of all, let me say a huge *THANK YOU* to those that have come to classes and visited the studio in the last year. I hope everyone had a wonderful Christmas with family and friends. We have lots of new and exciting things coming up in 2019. We are planning new pottery technique classes, fabric dyeing, Paint n SipSips, wheel throwing, glass, metalsmithing, stamping and much more. Be sure you are on the newsletter sign up list, or follow the Facebook page to receive the class schedule. See you at the studio in 2019! I have been so excited about this months Art Elements challenge because I use swirls in almost everything I do! Sometimes it is in the final touch on a painting and sometimes it is a big part of the design. Wherever they are they are fun and suggest movement. Fabric design is my go to project when I need to just do something creative for myself. This month I am showing you a batik piece with swirls. First I had to dye the fabric the color of the swirls, then draw the swirls on with wax, then discharge the color from the background until it was the lighter turquoise. I made a little fold over pouch with a lampworked glass fish, which I also created. He has a little Swirl also. Here is a shot of the Swirl batik on the inside of the pouch. I hope you enjoyed my Swirl piece. Be sure and check out the work of other artists that participated on the Art Elements blog. A few years back I was very involved in swaps and challenges on Flickr. Unfortunately many of those groups do not exsist anymore, and I was seeking some type of challenge to inspire me and make me work outside my comfort zone. I found the Art Elements group, which has a different theme every month for a challenge. What is great for me about this is that they welcome any medium! You all know how I toggle back and forth between mediums, sometimes daily. This month the challenge was seed pods. I would have never picked this element to work with in my work, but there was my challenge. My creative brain went in so many different directions with this theme, but when I started making simple sketches of the local seed pods I had collected, I knew I wanted a simple design. This decision led me to my block printing supplies. I picked out a couple of my favorite sketches and started making some hand carved stamps and prints. I started making black prints and really liked the simplicity of them. I did a couple variations, and added some turquoise. I have a hard time staying away from blue! Then I took these fabric prints and decided to turn a couple into quilted wall hangings. Ultimately my final piece was this print. I am really pleased with how this turned out. I used my hand dyed fabrics for the binding and backing. I am sure I will be making more fabric from these block stamps! This was just the inspiration and the challenge I needed to think outside the box with medium, color, style and theme. Go to www.artelements.net and check out all of the other artists seed pod challenge results! I am looking forward to next months challenge! How much fun would it be to get messy with some clay and create some bowls, cups and mugs? 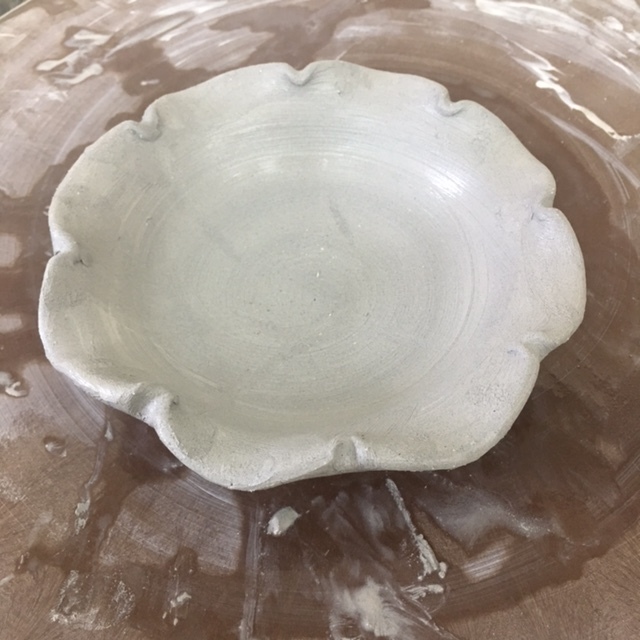 August 24th, 25th and 26th there will be a beginner wheel throwing class at the studio. Three full days packed with all the information you need to get started throwing your own pieces on the pottery wheel. There is only ONE SEAT left! Details are under the Classes & Workshop tab at the top. 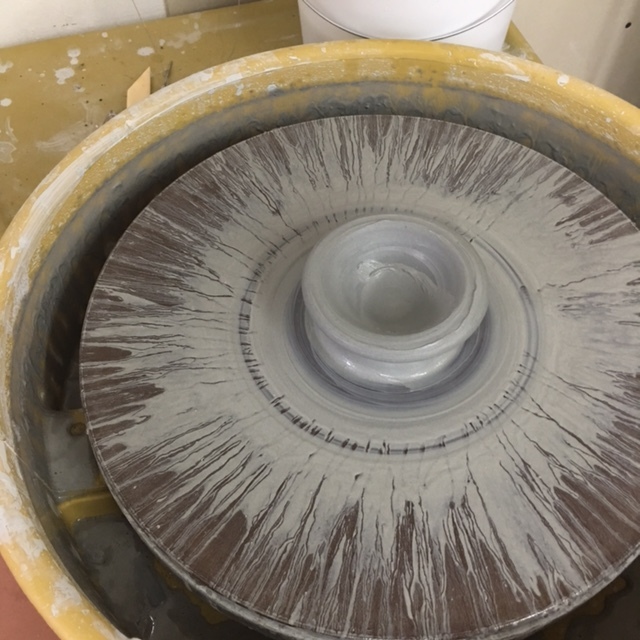 I threw on the pottery wheel for three years in college, but when I left I went several years (like 20!) without having a wheel to work on. This class is being taught by my college friend, Patricia Cates, who has spent the last 20+ years throwing on the wheel! Maybe you are not a beginner but would like a refresher class. This class would be perfect for that also! After you have completed this class you can come to the studio and work on your own. There will be a small studio fee to cover studio expenses. We are 95% moved into the new studio space! It seemed like it would never happen! I am still trying to figure out studio hours and when I do I will publish them. There is still work to be done, but it was time to get back to teaching classes. 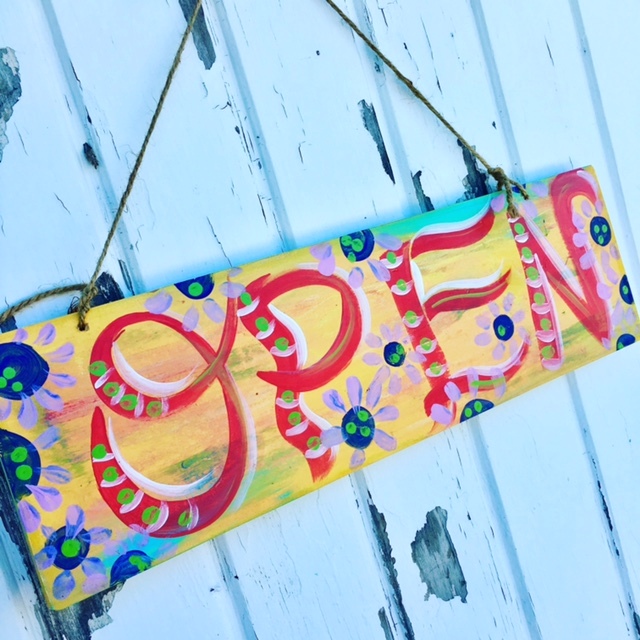 There is a pottery painting class this Sunday (May 6th) and then a couple Mother’s Day Paint and SipSips. On Saturday, December 2nd at 5:30 I will be hosting a Paint and SipSip on the grounds of the Abaco Christmas Festival. I am offering this class at a special rate of $45 per person. To ensure your seat, please pay in advance. 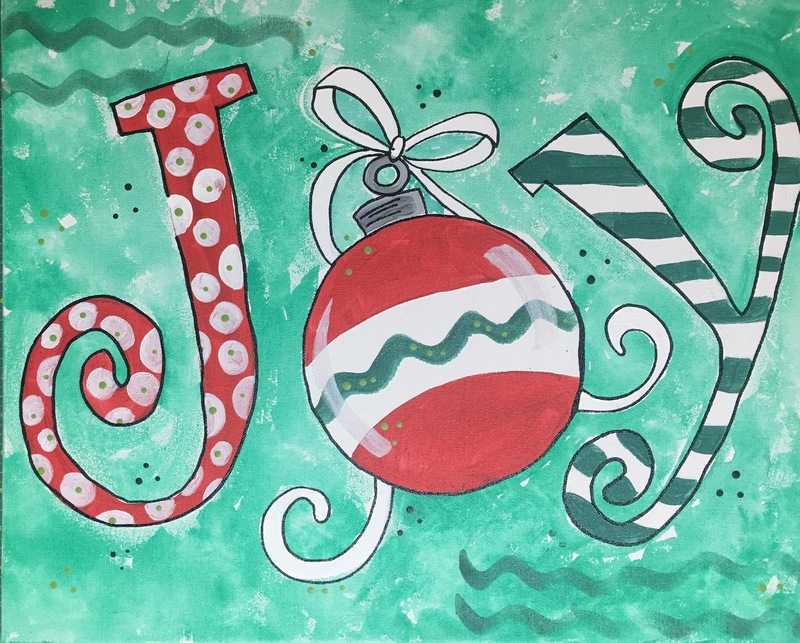 This fun and festive *JOY* canvas painting is 16″x20″, and lots of fun to paint. See you there!